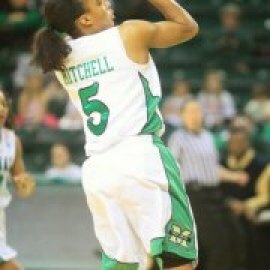 Coming off a 9-12 campaign in 2010 - 2011 Marshall Women’s Basketball was looking for improvement. Statistics reveal a successful search. But problems, some chronic, continue to impede program progress. 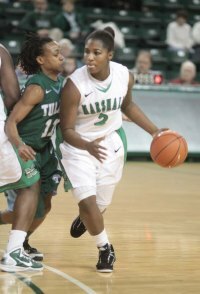 Against schedule opponents, including C-USA, Marshall prevailed in the following areas: points scored, 3-point field goals, free throws made, rebounds, and steals. Marshall had less turnovers against all scheduled opponents but more against its C-USA conference opponents. The Herd had fewer assists than both its schedule and conference composite. Lateidra Elliott led the team in scoring and free throws made. Erica Woods claimed field goals made, all rebounds (total, offense, defense) and minutes played honors. Other pace setters included: Orlandria Williams, FG percentage and 3-point percentage; Shynisha Johnson, free throw percentage; Shay Weaver, 3-point goals; Alaya Mitchell, assists; Victoria Wells, steals; and Leandra King, blocked shots. Points: Johnson; Alyse Poindexter; Shaw; Elliott; King; Mitchell; Weaver; Rashedah Henriques; Shaw; Elliott; Poindexter and Weaver; King and Poindexter; King and Wells; Woods and Mitchell; Woods and Poindexter; Shaw and Henriques; Elliott and Woods; Veronica Ruiz. Rebounds: King; Woods; Poindexter; Wells; Weaver; Henriques; Shaw; Elliott; Poindexter and Weaver; King and Poindexter; King and Wells; Woods and Mitchell; Woods and Poindexter; Shaw and Henruques; Elliott and Woods; Veronica Ruiz. Assists: Elliott; Dorina Barrett; Johnson; Weaver; Henriques; Mitchell; Elliott and Wells; Johnson; Mitchell; Barrett; Woods; Mitchell and Elliott; Mitchell and Henriques; Henriques and Elliott; Woods and Henriques; Ruiz; Wells; Henruqies and Elliott; Henriques. Steals: Wells; Johnson; Woods; Mitchell; King; Ruiz; Barrett; Henriques; Mitchell; Woods and Shaw; King; Williams; Wells and Elliott; Weaver; Wells and Weaver; Wells; Elliott; Weaver; Shaw; Dickens; Mitchell and Henriques; Woods and Henriques; King; Weaver; Williams and Dickens; Shaw; Elliott; Woods; Poindexter. Blocks: Poindexter and King; Dickens and Poindexter; Poindexter; King; King; Dickensand Chukwuka Ezeigbo; Dickens and King; Dickens; Wells and King; Ruiz; Mitchell and Poindexter; Williams; Poindexter. Marshall opened the season 12 - 3. The start included a 3 - 0 C-USA report. The 4 - 11 second half meltdown included a 4 - 9 conference finish, a loss to WVU and first round conference tournament elimination. Study brings out added interesting covert stats. Elliott was the only player with more assists than turnovers. Barrett played to an 18 - 18 stand off. Wells was plus 14 in steals versus turnovers. Marshall, in the first half of the season, finished 9 - 1 after halftime leads.The Herd won 3 of 5 games after trailing at halftime. The C-USA marks were 2 - 0 with leads at halftime and 1 - 0 when trailing. Over the second half of the season The Herd had 9 halftime leads and finished 2 - 7. All nine games were in conference. A conference game tied at halftime turned into a loss. With halftime deficit’s the Herd finished 2 - 2 in conference and 0 - 1 against WVU. 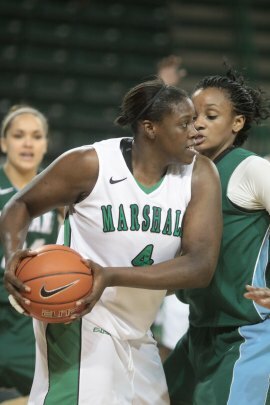 Marshall won 19 of 30 game rebound battles against schedule but was 7 - 10 intra conference. In the paint Marshall outscored opponents 16 times, lost 13 times and tied once. Conference numbers were 7 wins, 9 losses and 1 tie. Conference opponents dominated points off turnovers. The final numbers were six wins, 1 tie and 11 losses. Overall the numbers totaled 10 wins, 18 losses and 2 ties. Second chance points were a 15 - 15 tie on the season. Conference numbers were 5 up and 12 down. Fast break points favored the Herd 14 - 11 - 5, and in league the edge totaled 9 - 7 - 1. The bench points edge belonged to Marshall 23 - 5 - 2 and 12 - 3 - 2. Chadwick attributed the problems to eleven newcomers and their inexperience. From the above, an inductive leap produces conclusions. * Marshall has reestablished residence among conference mid pack teams.The Herd is again a force against conferences and teams with a lower RPI. Life among the conference penthouse programs remains an unachieved goal. * Problems of maintaining halftime leads against the conference need to be addressed. * Turnovers and points off turnovers allowed against conference teams remain a major and chronic concern. * Only 5 players converted field goals at 40% or above. The inability to finish point blank shots surfaced periodically and it terminated a season sprinkled with success. * Paint and second chance point deficits suggest a lack of post and low paint presence. * Defensive transition short falls produce fast break points. Program fans have seen the scenario before. * The conclusions in turn lead to this final thought. Marshall’s most potent enemy is itself. As the program resolves its problems improvement follows. Resolution of some problems was initiated last fall. Two point guards and a post player committed to Marshall for the 2012 - 2013 season.The potential for working on others lies in off season programs and next fall’s preseason practice. The time frame is crucial, according to unofficial sources, if key program elements are to continue.